The Trees Subgroup’s members are: Hannah Gwawr Davies, Suzi Martineau, Anthony Ward, Bo Walsh, Indra Donfrancesco, Malcolm Higgins, Kevin Redpath, Ian Mutch, Matt Gilson and Lindsay McDougall. All of us have a professional or personal interest in trees in our community. 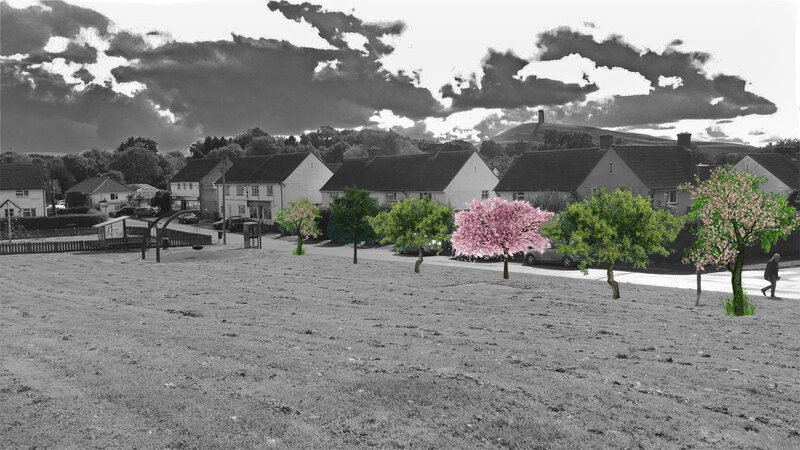 1/ Reviewing the existing trees in Glastonbury’s built environment and using street photography and Photoshop to explore the visual impact of planting suitable trees in areas of the town that could benefit from further canopy cover. 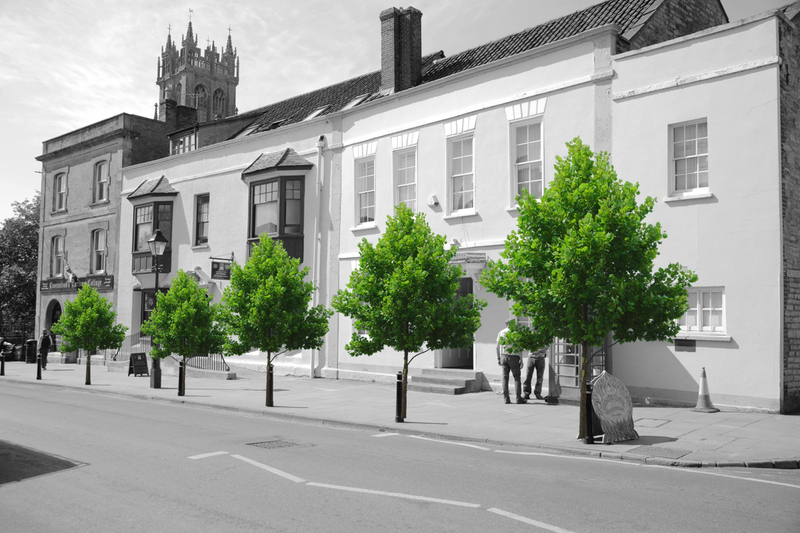 What might our town look like with more trees planted within our town centre? 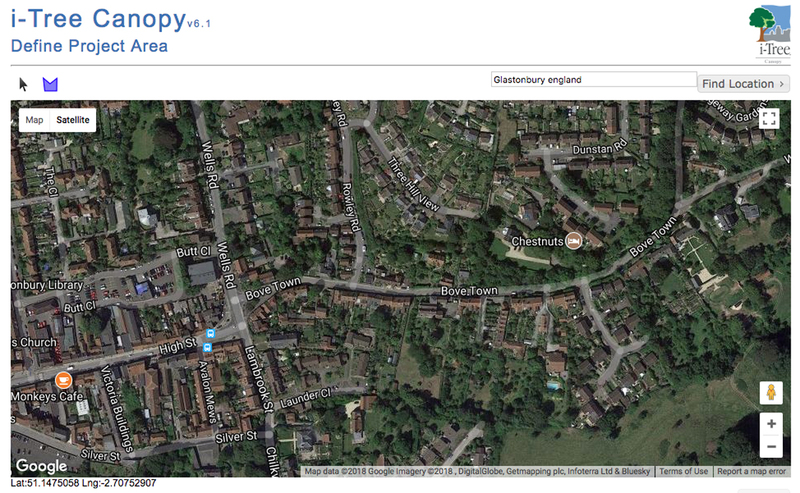 We wish to increase the number of trees in Glastonbury’s Town Centre. Trees perform a number of vital roles in supporting biodiversity, provide attractive shade and shelter for residents and visitors, offer pollination for bees and improve the mental and physical health of residents. They store carbon, filter pollutants, reduce storm water runoff and provide a myriad of benefits, all at the same time and at very little cost. 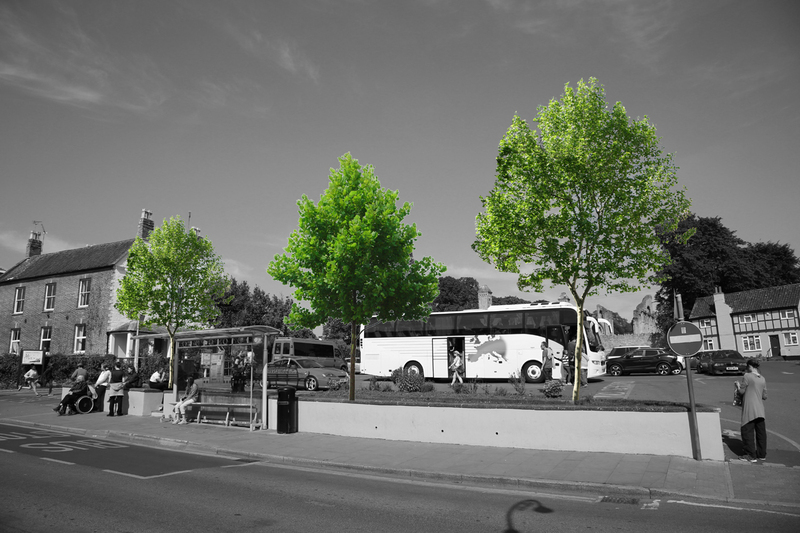 Trees and shrubs will help our community to adapt to the effects of Climate Change. 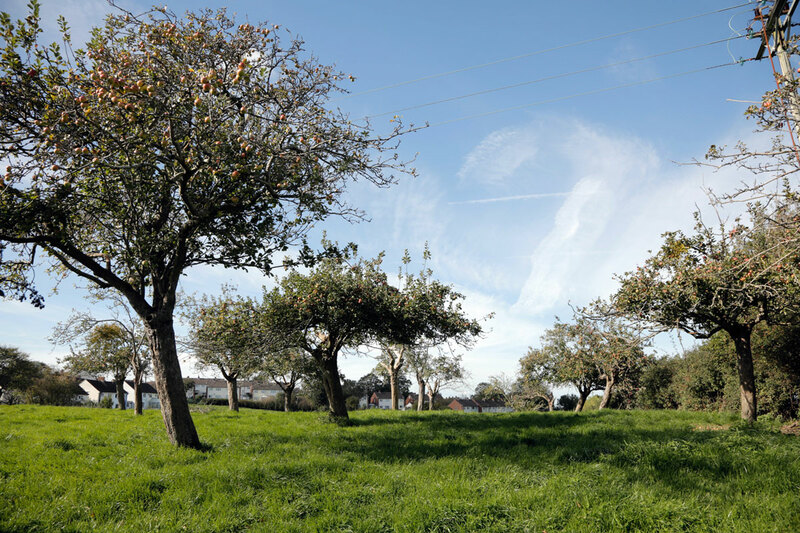 2/ We have listened to members of the community about their support (and concerns) for additional tree planting on the Windmill Hill recreational area, Cinnamon Lane recreational area, Watts Corner and Sharpham Road. 3/ We have spoken to Snows Timber, Tescos and other manufacturing and distribution businesses on the Wirrall Park about lessening the visual impact of their buildings through tree planting. 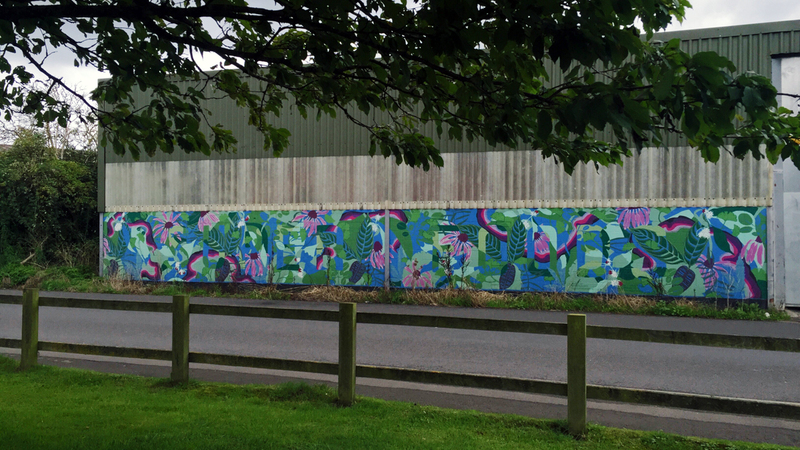 The painting of tree and foliage designs on the sides of some of the larger buildings and warehouses on the Wirral Estate. 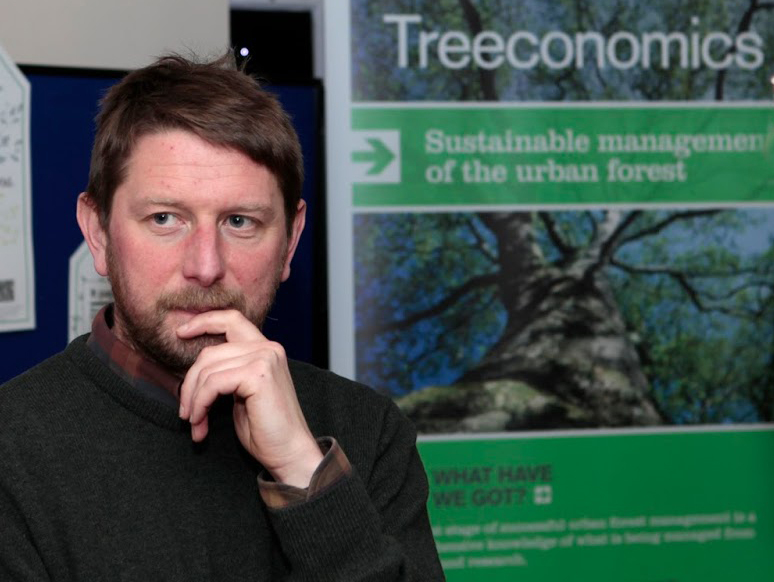 4/ Hosting a day’s workshop with Kenton Rogers of Treeconomics from Exeter University about the detailed mapping of Glastonbury’s existing canopy cover using iTree Canopy Cover in conjunction with Google Earth’s satellite images. Kenton has been commissioned to produce a report that will provide us with a benchmark to ensure the town’s percentage of canopy cover is not lowered through development or expansion so that developers will have to factor tree planting in their site proposals to match or exceed the canopy cover that is being lost. We have agreed a budget for him to train three members of our Steering Committee to conduct the aerial survey of Glastonbury’s canopy cover. 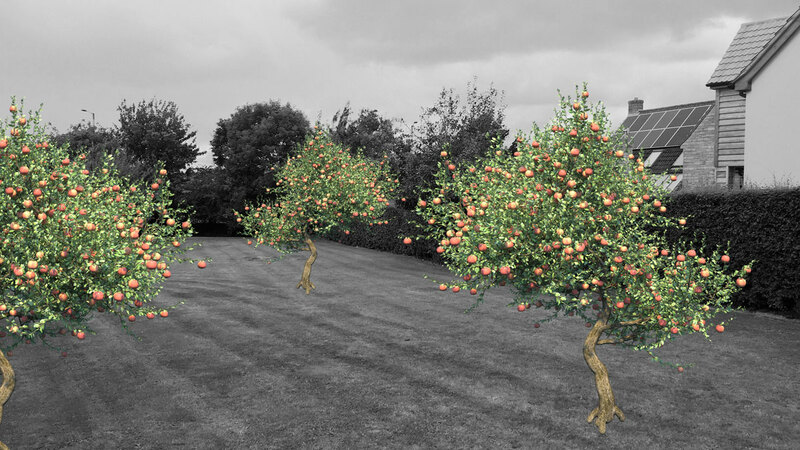 5/ Mapping the community’s existing orchards / apple groves and talking to existing land owners to explore the potential of planting a new community orchard. 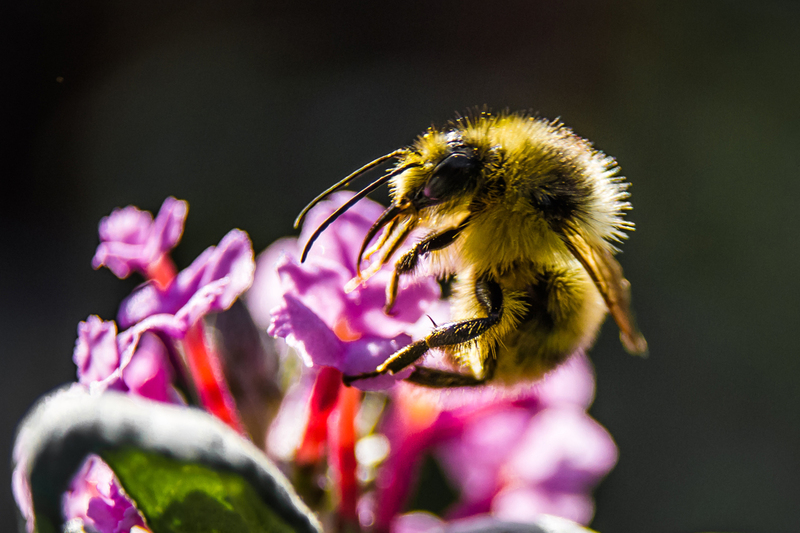 6/ Corresponding with neighbouring parishes to help develop pollination corridors throughout our town and out into the countryside for the benefit of wildlife and bees and the health and wellbeing of all the residents of our community. 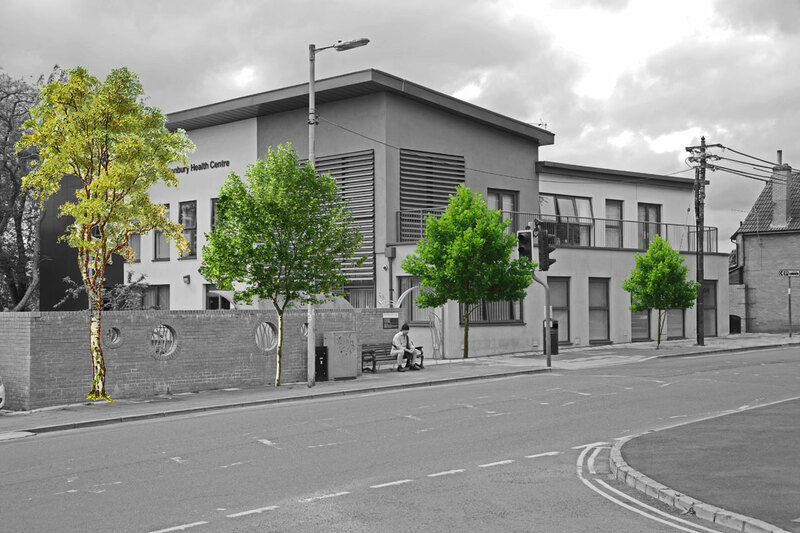 7/ Using site photographs and Photoshop to visualise and record where additional trees could be planted to replace those lost to disease or development. 7/Suzi Martineau is founder of the Tree Conference. 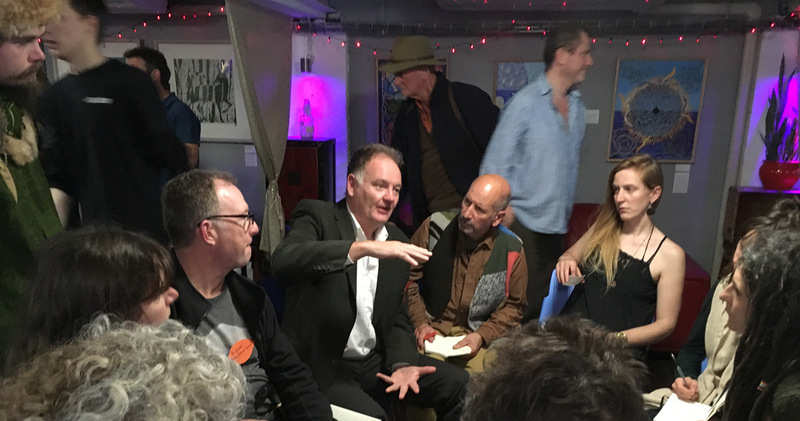 The first event was held at Glastonbury’s Red Brick Buildings on the 4th November 2017. Films of the speakers can be found at www.thetreeconference.com/films. The 2018 Conference will focus on Trees in Education and will also continue to explore templates for local planting projects and methods, global reforestation, protection of old growth forests alongside some cutting edge science about what trees are really up to. 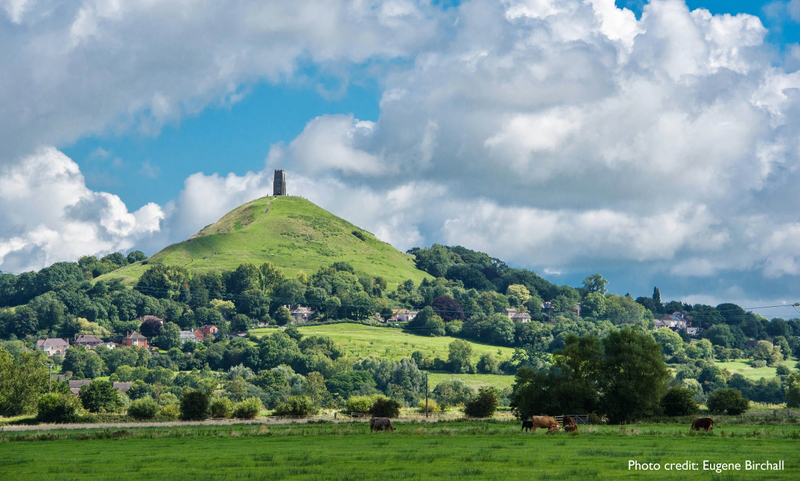 8/ Hosting an online questionnaire to gather opinions on additional tree planting on the slopes of the Tor – what species, where planting could take place and their ongoing management and care. To date more than 300 people have replied to the questionnaire and the results are currently being collated. Members of our sub group are liaising with Ian Clemmetts of the National Trust who own the Tor. 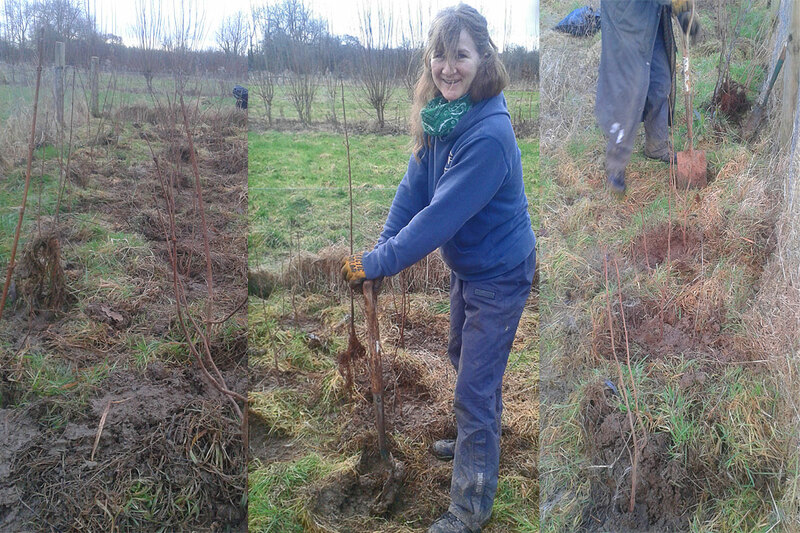 9/ Receiving a donation of thirty field maple and hazel trees (a gift from Longleat – thank you!) and heeling them in for overwintering, in preparation for planting in the community later in the year. Thanks to Oli Frost for providing us with the land and for Oli and Chanah for the rapid planting. When Chanah commented on the speed with which Oli planted the trees he replied ‘This is how I used to get 1,000 trees a day planted’. 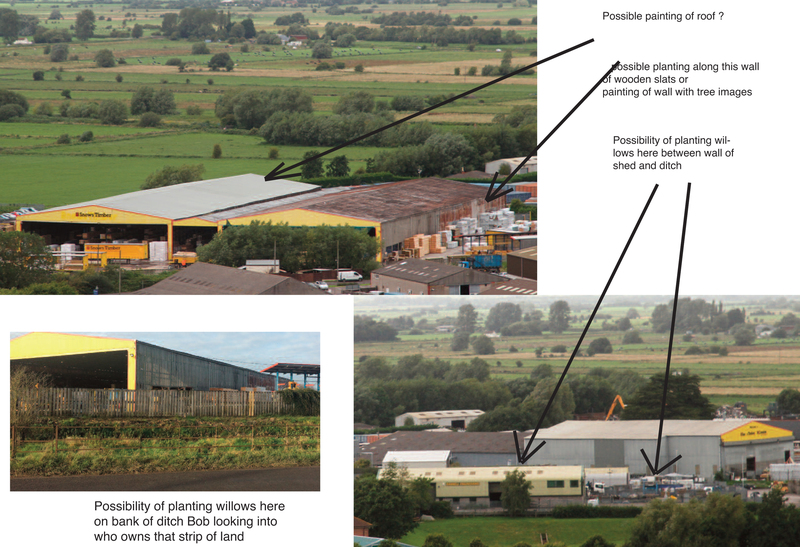 If we just had a few Olis and enough land, imagine how much of Somerset could be covered in trees……..